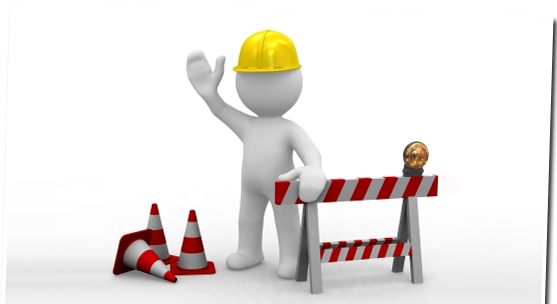 This blog site is long overdue for maintenance. You may notice some hiccups in old posts and links, even the look. Hopefully problems will be resolved in a week’s time. Eclectique916 blog celebrated its 3rd anniversary in August. What was that first post? — just for old time’s sake. For those of us living in the capital city of the United States, it has been a week of great things: an unexpected earthquake, the opening of the Martin Luther King, Jr. Memorial on the national mall, and now Hurricane Irene which caused the cancellation of events for the dedication of the MLK, Jr. Memorial but is yet to play out its true nature in our area. One can tell by the lines in the groceries stores that we’re pretty much indoors through most of the weekend. I was one of those sideline critics of the King memorial re how best to use millions of dollars raised impressively quickly from many sources, monies that could build foundations, improve schools, health programs and all that King envisioned for the beloved community. I was even a critic of the choice of artist (not made in the U.S.A.) and what appeared to be a “Walmart” effort to create a legacy for donors. Once the memorial was in place, it was time to deal with the physical reality. The power of the King memorial as symbol. How could I forget my Carl Jung and ignore the human hunger for signs and symbols? For many that came Tuesday on the day of the earthquake. It shook the biggest, baddest, most fearless human begins to their core. The idea of not knowing, of not being in charge or control of your own or anyone else’s being and destiny may have been the most unsettling. The scientific answers meshed with the metaphysical ones. On the National Mall, the Washington Monument which was completed in 1884 and is one of the city’s most defining landmark symbols, suffered substantial cracks near the very top of the obelisk structure. The Washington National Cathedral (The Cathedral of St. Paul and St. Peter) suffered substantial damage to its English Gothic revival landmark. Much of the stonework was carved by hand starting in 1907 and finally competed in 1990. Millions of dollars in private donations will have to be raised to make repairs. For now, both landmarks are closed to the public. But the MLK, Jr. memorial (the new kid on the block), a project initiated by Dr. King’s fraternity, Alpha Phi Alpha, still stands tall, not a crack, no shifting, no leaning. After all, no Alpha man lowers his head to the ground. I’ve warmed up to the monument and the sculptor who realized the design, Lei Yixin, who has suffered through the criticism of persons louder than myself. To be honest, how many sculptors do we have in the U.S. who can carve into hard rock or another Mount Rushmore? How many opportunities are there to do so? Lei has had a lot of practice including carving statues of Mao Zedong in his native China. Personally I had no problem with his resume. Anyone who’s created propaganda art including Leonardo da Vinci and all the artists for the National Mall memorials knows it’s all about immortalizing humans into symbols. Funny, the symbol of power cracks. The symbol of non-violence and peace stands tall and strong. Tonight the MLK, Jr. memorial must weather the literal storm. If nothing else, I respect and am intrigued by the symbolism of the memorial in the wake of Hurricane Irene. I can’t help but think of the words of one of Dr. King’s favorite gospel songs, “Precious Lord,” in Mahalia Jackson voice — “Through the storm, through the night, lead me on to the light.” (Mahalia Jackson sang “Precious Lord” at Dr. King’s funeral in 1968.) What is our relationship with metaphor? Hopefully, the memorial will be for the Alphas, donors, and all who contributed $$$ to its realization a symbol of an accomplishment that will inspire them and others to put those energies into the vision for humanity Dr. King saw from the mountain top. 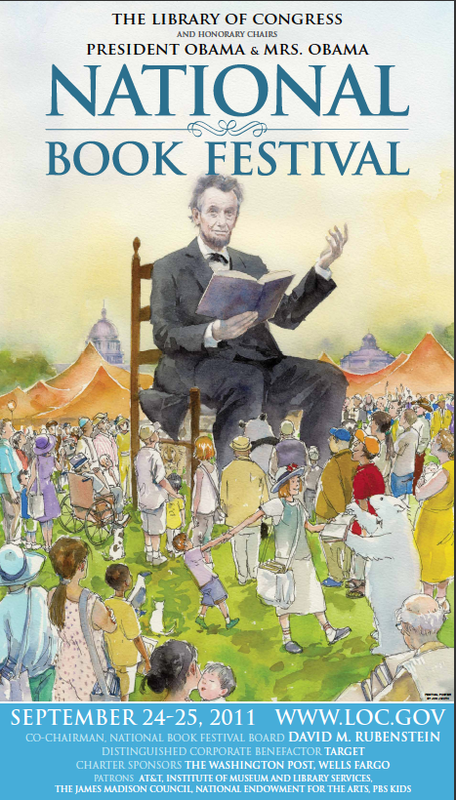 Turning the page….Will the book festival be next? Apparently, e-books did not kill the publishing industry. But it definitely has been the kiss of death for store front book sales. I was crushed not to be able to pick up a morning coffee and a magazine or regional cookbook from Borders on Union Square in San Francisco last month. Where have all the book stores gone? My refuge from the noise. Coming in September are the book festivals. I have to give Baltimore the first billing because since the Library of Congress launched their book festival in 2001, Baltimore has felt a little slighted by the book loving public and author agents trying to get their clients on a bigger stage. Baltimore was the first, and they want you to know that. On the front page of the festival site is an announcement for JOBS. The Baltimore Book Festival is looking for production assistants to work behind the scenes. Aside from that, new and veteran authors will be part of the festival including hip hop recording artist Common, mystery writer Laura Lippman, Sherman Alexie, Terry McMillan, Tavis Smiley, and Washington Post food editor Joe Yonan who released a cookbook for singles (that means one plate). National Book FestivalJust 45 minutes away, authors appearing in the Baltimore Festival will make a B-line to read at the festival on the national mall. 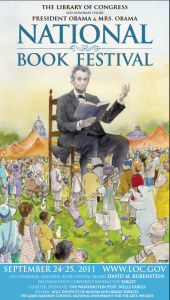 The press release says, the National Book Festival is “Your Authoritative Source for … Authors!” As I’ve mentioned before, the first year of the festival took place on the grounds of the U.S. Capitol with readings in tents and inside the Library of Congress. Co-founder First Lady Laura Bush made a casual appearance in a powder blue pants suit that really looked more attractive than it may read. I’ll never forget seeing her eating a taco from a local vendor. Sadly those carefree pre-Homeland Security days are gone. But the book festival is still here, and obviously needs a lot more room for authors like Toni Morrison, Wally Amos, Sarah Paretsky, Esmeralda Santiago, Garrison Keillor, Lisa Yee, Amy Chua, and many, many others. Come early, stay late. There is a book sales tent/store and a book signing schedule. I usually come to see the authors and run into some friends. Looks like all the good jobs are taken, but the festival accepts monetary donations. New York Is Book Country was the first book fair I ever attended. Part of its success was the open door block party atmosphere of it with all the Madison Avenue book stores hocking their wares inside and out. Well, what did I say earlier about the demise of the store front book store? Last year New York Is Book Country was cancelled. Even their website is like a ghost town. But Brooklyn’s apparently cranking out a festival to satisfy the literary appetites of Manhattan and the borough. Just when you thought Fran Lebowitz would never leave Manhattan. Think again. See the line-up here. It’s definitely NY-centric, but if you can publish there….you can publish anywhere I suppose. Thomas Sayers Ellis will be at the festival. See his Eclectique interview. So far no schedule is posted which says this festival is still in the stages of rising to the occasion. Poet, writer Kwame Alexander also announced the cancellation of the 2011 Capital BookFest which featured African American authors in the DC area and even expanded to Charleston, SC. This note is to officially announce that the Capital BookFest will not be taking place in 2011. We’ve made this decision because of economic and other reasons. Certainly, we never started this event to make a lot of money, but we also did not want to lose money as we have for a few years. Also, as I am a writer, I’ve decided to spend more time actually writing. This does not mean that our event will never resurface, but for now, we are taking a breather. Is the book festival going the way of the book store, or is someone ready to launch an e-book festival app. 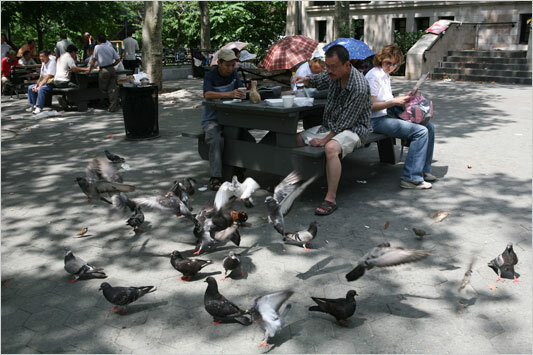 Why do I feed them crumbs? Download the collection of poems from this link. If at first you don’t secede…. 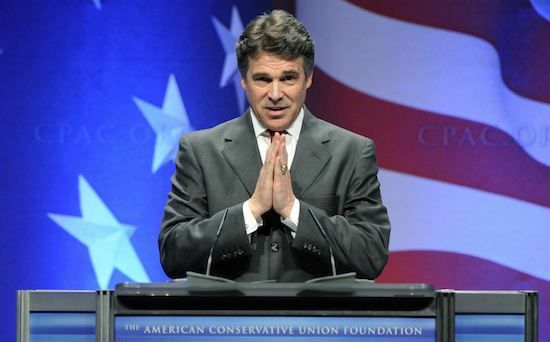 Texas Governor Rick Perry officially announced his bid for President today in Charleston, SC, the first state to secede from the Union right after Lincoln’s election — I’m talking about 1860. Has this Texan who wooed secessionist hearts decided being part of the union isn’t so bad afterall? Will he revoke Juneteenth? Another Texan. Is this the “back to normal” Republicans have been waiting and holding hostages for? The latest Fred Thompson moment? A shiny new Tea Party character for the press? (How will Sarah top this? ).